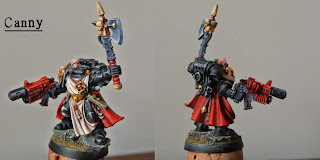 So The sargent is coming along well, hes almost done. Check list gold on combi melta. Finish the gold, metal, and handle on the axe, do his pupils and some spot details here and there. Also finish the gold skull on the back of the cape. Thanks for looking comments welcome. Wow. That is a strong mini! Thanks Zab Im quite pleased with him, he will look great on the table.